This expedition includes a scientific program developed by experts. Alan Le Tressoler, the expedition leader, wants to make scientific measurements that have never been made at the geographic North Pole on such a long period. The main interest of the team is the study of sea ice, which in this area can not be done by satellites. They will make a collection of meteorological datas and they will also make an assessment of marine microbiology. All these measurements requires a human presence on the spot. Alan Le Tressoler : Being graduate in Engineering, holding a Masters in Maritime and Oceanic Law, skipper and captain, Alan The Tressoler was hired as an engineer logistics IPEV (French Polar Institute Paul Emile Victor) and the Alfred Wegener Institute (German Polar Institute). Being found of the polar fields, he has guided on foot, on skis or with a snowmobile, the leading scientific experts in their fields of study, the Arctic. He also assured the process and data collection of various scientific measurements of the programs he was in charge throughout the year. As pure adventurer, in his spare time, he performed alone or in teams explorations of several weeks on skis or on foot. For this expedition, he is mainly in charge of the logistic and equipment. He should also take care of the satellite relations between the field and the scientist world outside the Actic. Julien Cabon : Lieutenant, see Cols Bleus, the magazine of the french Navy. When he first went to the Arctic, it was to write a book about Alan Le Tressoler, then the most northerly man of the world. But once arrived in situ, he was asked to replace, alone, the crew of the famous sailing boat The Vagabond. For five weeks he had to stay, caught in pack ice, totally isolated from the world, and alone on the frozen ocean with three huskies and many polar bears as only companions. Familiar with extreme environments, Julien Cabon has traveled the deserts of the Horn of Africa on a motorcycle, crossed the Red Sea on board a ship of smugglers, covered the conflict between Israel and Hezbollah in Lebanon, more than one board months in the Indian Ocean aboard a nuclear submarine ... He is the author of'' Men in the Sea''. In recent years he has produced reports in over fifteen countries. 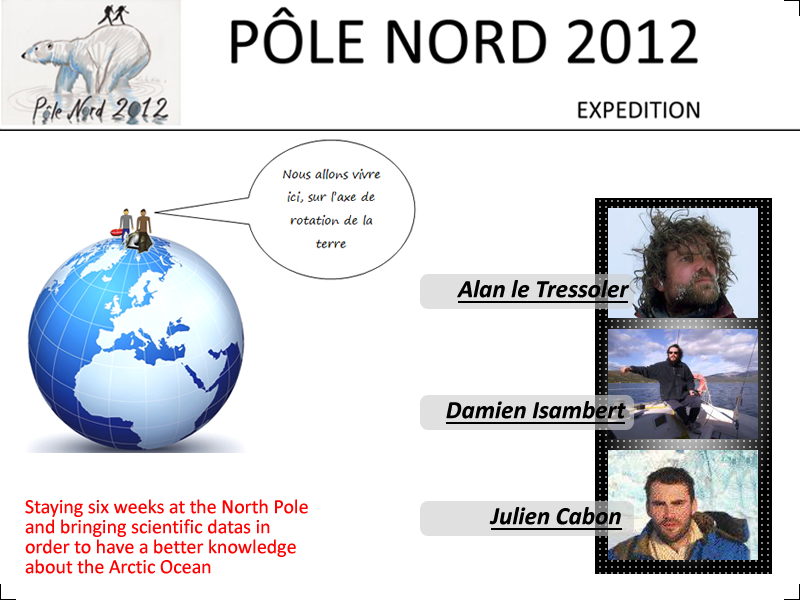 For this expedition, he is mainly in charge of communication, patronage and sponsorship. Damien Isambert : As Electronics Engineer, Damien Isambert was also hired as an engineer logistics by IPEV (French Polar Institute Paul Emile Victor) and the Alfred Wegener Institute (German Polar Institute), following his friend Alan Le Tressoler for 16 months. He then specialized in organizing logistics for the first Norwegian Polar Institute in the summer of 2010 (in Spitsbergen). He was also taking part with several scientific projects, including a glaciology project in August 2010. One year later (summer 2011), he worked in the field of oceanography, climatology and geology aboard his houseboat "I dream so you live", a 36-foot SunShine. For this expedition, he helps the organization, including security, and searches for for technical and financial partners. Apparently he will not join the other people on the field. Please discover here (unfortunetaly in French only) an interesting article (published by "Le Télégrame.com") about the frenchmen who are living in Ny Alesund, Svalbard, a french base of the french polar institute.